Krishna Engineering Works is leading manufacturer of Winder Rewinder for Inkjet Printer Thermal Printer. 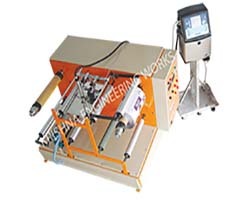 In any paper, film and foil conversing industries, the Winder/Rewinder (Doctor Machine) is used widely for on-line printing of Mfg. Dt., Exp. Dt. B. No. etc. using Ink- jet printer or other contact coding machines from Roll to Roll at high speeds & then these printed roll are used in various packaging machines. We also make Slitter Rewinder Machine, Doctoring Rewinding, Rewinder Unwinder, Rotogravure Printing Machine, Flexo Printing, Lamination Machine and more for leading industries. Max. Designed Speed : 100 to 150 Mtrs / min.